1. Workshop with Lauren Walker Saturday March 31 2018, a free introductory workshop in abstract and mixed media painting techniques from 1 to 4 pm at the Art Gallery of Nova Scotia. Ages 16 and up. 2. Reception at the Art Gallery of Nova Scotia from 6-8 pm on March 31, 2018. 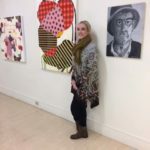 Meet Lauren Walker she will give an Art Talk ; and will run through the work on display, and talk about process, concept and inspiration etc. , this will be followed by refreshments. 3. Opening Reception for ‘Influence’ at the Art Gallery of Nova Scotia from 6-8pm on Saturday April 28th 2018. 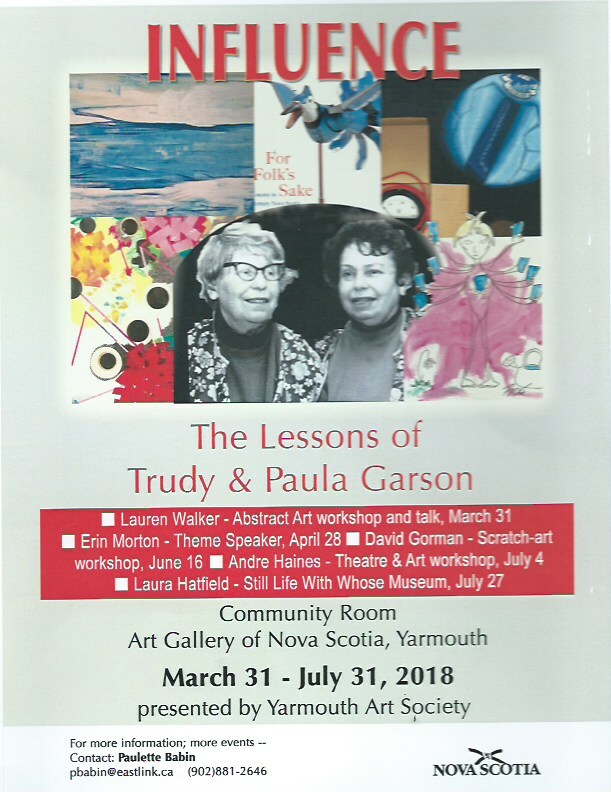 Guest Speaker is Erin Morton she will talk about Trudy and Paula Garson; being a student in their art classes,their place in the art and economy of 20th century N.S. Erin’s book, For Folk’s Sake (2016) will be on sale. 5. Workshop with David Gorman, Saturday June 16, 2018 .The lesson will be ‘Scratch Art ‘and the free workshop will be held from 2 to 4pm at the Art Gallery of Nova Scotia for ages 13 and up. 6. Workshop with Andre Haines, Wednesday July 4 2018, ‘Theatre and Art ‘ a free workshop with theatre, games and related art activities.From 1 to 4 pm at the Art Gallery of Nova Scotia, Ages 7 to 10. 7. 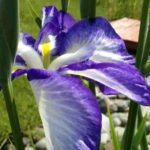 Workshop with Laura Hatfield, Friday July 27 2018, Still Life drawing ; an event based work.This session is based on the still life lesson that began each term with the Garsons.From 6 to 8pm at the Art Gallery of Nova Scotia, Ages 16 and up. Alice presented the group with a slide show and handout on the basic principles of landscape design. Many proceeded to application with a hands-on example in the workshop portion. Alice provided helpful advice how to design and create your own back yard oasis. Creativity, questions and ideas contributed to this fun afternoon workshop. This program was supported by the Friends of the Art Gallery of Nova Scotia Yarmouth. 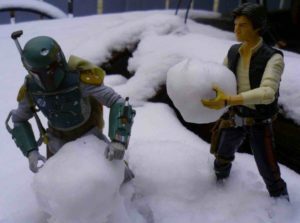 Photography basics like composition, depth and light were scaled down to tell stories about a favorite toy, using simple props and backdrops. Participants only needed to bring a digital camera and favourite small toys. All other materials were supplied. Ages 6-12; children were accompanied by an adult. This program was supported by the Friends of the Art Gallery-Yarmouth. 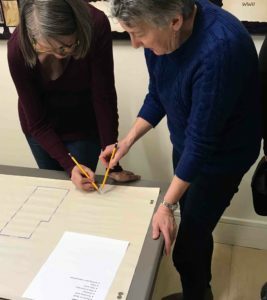 FOR: a New Horizons seniors project titled “Looking Out, Looking In: Windows with a Community View” sponsored by the Friends of the Art Gallery of Nova Scotia, Yarmouth. DUTIES: to lead, organize and manage the “Windows” project. OVERVIEW: The primary objective of the project is to engage seniors of diverse backgrounds by creating inclusive opportunities to enjoy social interactions with their own and other generations through a series of arts-based workshops and other arts-related activities. A secondary objective is engaging seniors in the community through the mentoring of others through sharing “folk” arts and crafts, music, stories and skills. Measurable outputs include the production of an art exhibition, arts events, and recorded stories that preserve folk knowledge, and stimulate community-building social activities and cultural exchanges. This position involves outreach work with seniors and others, as well as members of various community organizations in the Tri-Counties. A valid driver’s licence and access to a vehicle is required. APPLICATION DEADLINE: Application must arrive by 4 pm. March 29, 2018. HOW TO APPLY: Send resume and cover letter to the Friends of the Art Gallery, c/o Angela Collier at angela.collier@novascotia.ca; or deliver to the Art Gallery of Nova Scotia, 341 Main St. Yarmouth, N.S.